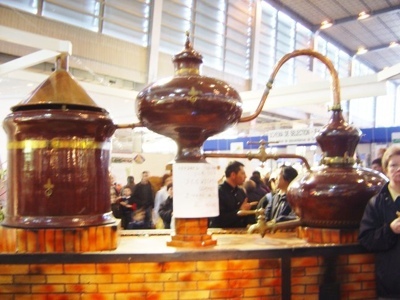 "Bastille 1789 is produced from barley and wheat from northeast France and water from Gensac Spring. Distillation takes place in alembic pot stills. The resulting whisky is aged for 5-to-7 years in a combination of Limousin oak, cherry wood and Acacia casks." 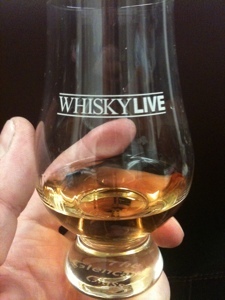 I came across it at the Palm Bay booth at Whisky Live NY. Larry Neuringer poured me a glass and I put 50ml in a sample bottle for this review. Bastille is aged in three kinds of woods - and they are unusual woods for aging whisky: Limousin oak, cherry, and acacia. I'm not aware of any other whisky aged in acacia. Cherry is also very unusual. French oak, however, is used in Compass Box Spice Tree and Oak Cross. The French white oak (quercus petraea) - also called Sessil Oak gives a spicy heat. Finally, Bastille 1789 is bottled at 40% abv. At Whisky Live I noticed an oddly South Asian spiced nose and delightful fruity sweetness on the palate - but I was, to be honest, getting giddy and partly baked at that time. How would it taste in the cold sober light of day? Color: light orange/amber gold - very pretty. Nose: a bit raw, raucous and spirity. First impression is an odd savory spice note reminiscent of curry - perhaps a little sulphur (but not enough to be a problem). Then a lovely note of fresh apricots, ginger, and cherries followed up by some unsmoked salt pork and a hint of spicy oak. Fruity, oaky, spicy - but a tad hot and rough. Entry is, again, spirity, and immediately spicy with a cinnamon/clove heat that Compass Box Spice Tree taught me is French Oak. The mouth feel is silky, but the heat is zowie wowie. Then the expansion has sweet notes with cherry, soft citrus, and vanilla. These fruit notes are a bit shy and only suggest a sweetness: the actual presentation is more off-dry than sweet. The turn to the finish is marked by more spice with peppery oak and heat. The finish is moderately short for the fruit and wood notes but the spice burn lingers much longer ("cinnamon Altoids" G-LO said of Compass Box Oak Cross). There's an herbal bitter note in the finish that sits right after the cherry sweet. This finish note reminds me of acacia trees - but maybe that's just auto suggestion. Bastille is a lovely collection of flavor elements, but the overall impression is a bit lightweight from a flavor density perspective. It just needs a bit more - but I'm not clear on how to suggest a way to achieve it. More time in wood might make it too hot and it's already spicy enough. I could use more oak and more sweetness and more vividness in the fruit notes. An obvious comparison point is with Compass Box Spice Tree, not just for the oak spice - but also for the curry notes brought by the Clynelish in its blend - so I queued up a dram. The Spice Tree is immediately sweeter, bigger, and more august. It has a richer balance of sweetness, wood flavor and wood tannins, and the quercus petraea cinnamon / clove heat. The Bastille 1789 Seems a bit young and low density by comparison (which, to be fair, isn't a fair comparison at all given that Spice Tree is blended from conventional top notch Scotch single malt whiskies). The flavor profile of Bastille 1789 is really quite different - not just from Spice Tree - but from anything else I've ever tasted - and shows much promise. It's quite drinkable now - but I hope future expressions figure out how to settle the raucous nose and spirity hot entry and give it deeper, richer flavors and a more august presentation. It could really be one of the greats. As it is, I can still recommend it, but not highly. Probably just needs some time in refill bourbon barrels to give it a good base that they can build on with their other casks. Lucky for them, they don't have the SWA telling what they can and can't do, so experimentation is wide open. Yes - you're right about about clean refill bourbon barrels. But that would be a fairly fundamental change. Daucourt is using totally French barrels. It's all French end to end. He may not be able to avail himself of a softer sweeter oak option. If he can, I suggest that he does so... Otherwise, I applaud his very creative spirit. It bears comment that the wheat component is coming in grain neutral spirits - making this a blended product. I suspect that is the root of the flavor density issue. 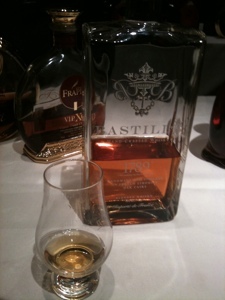 It will be interesting to compare this to Brenne, a single malt whisky from Cognac due to launch in October 2012. I'll be sure to do a head to head. I saw this whisky last week while puttering around in a local liquor store, and was wondering about it. Thanks for the review. My wife bought me a bottle on a whim. I really enjoy it. Nice review. An impressive share, I just given this onto a colleague who was doing a little analysis on this. And he in fact bought me breakfast because I found it for him.. smile. So let me reword that: Thnx for the treat! But yeah Thnkx for spending the time to discuss this, I feel strongly about it and love reading more on this topic. If possible, as you become expertise, would you mind updating your blog with more details? It is highly helpful for me.